Hot on the heels of its first major CES keynote this month, AMD is ringing in a few notable changes for its senior leadership team. These are important to know because such moves offer insight into how AMD plans to increase market share and growth. At the upper echelons of leadership - C-level executives - AMD historically hires from other companies. A new role is being created for managing all aspects of strategy, business management and engineering for AMD’s PC, graphics, and semi-custom business lines, and it effectively consolidates a number of existing responsibilities into one. To this end, starting next week, Dr. Sandeep Chennakeshu is hired in the capacity of Executive Vice President, Computing and Graphics Business Group. Steeped in an engineering background, he holds 170 patents and has previously been president of BlackBerry Technology Solutions. 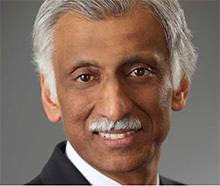 Prior to BlackBerry, Chennakeshu served as senior vice president and general manager of Freescale’s Wireless and Mobile business group. From our viewpoint, it is interesting that AMD has sought the expertise of someone not immediately recognisable in the PC, graphics, or semi-custom business space, though it is sensible to assume that Sandeep Chennakeshu and Lisa Su, AMD CEO, have worked closely together before - both had senior leadership roles at Freescale 10 years ago. In other related news, Mark Papermaster, AMD CTO, arguably the man most behind the engineering efforts for the high-performance Zen architecture, sees his official job title change to Chief Technology Officer and Executive Vice President, Technology and Engineering. It is usual for large technology companies - ~10,000 employees - to have Executive Vice Presidents one notch above Senior Vice Presidents, and to the best of our knowledge, it is the first time that AMD has incorporated the EVP title. Last but not least, and speaking from a UK perspective, Darren Grasby, the current SVP of Global Computing and Graphics Sales, is promoted to Chief Sales Officer - a job title previously held by another Brit done good, John Byrne, a few years ago. 2019 looks to be an exciting year for AMD, and we will be keeping a close eye on how the senior leadership team progresses. Otherwise this collector's product will be differentiated only by packaging and price. Both these mobile and desktop CPU roadmaps are said to come from a 2019 Dell presentation. That could be a sign of a mindset change inside AMD to look at the big stuff and the big picture. But nice to see leadership changes that are due to a growing business for once. Agreed, AMD needs all the talent it can get especially in the leadership roles. I don't think they have a problem with leadership, Lisa has proven that. But i do think she will have a problem driving, effectively, two companies at once. So bringing in some trusted help is a good idea.